Meeting agenda included a review of 2012 activities and accomplishments, nominees for 2013 Officers and Board of Directors, and a lecture by Julia Bachrach who spoke to the recently released second edition of her book entitled “The City in a Garden: A History of Chicago’s Parks,” a compelling look at Chicago’s remarkable and sometimes overlooked park system. We were pleased to have Julia Bachrach as a guest speaker at the Frederick Law Olmsted Society’s Annual Meeting on January 18, 2013. 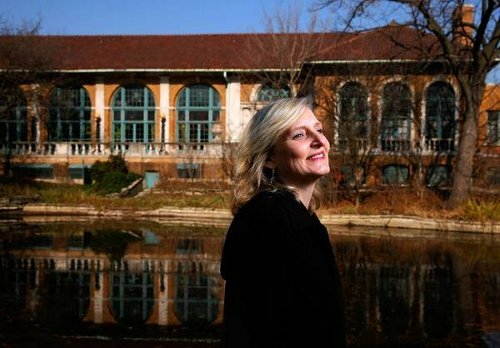 Following the 7:00 PM business portion of the meeting, Julia will speak to the recently released second edition of her book entitled “The City in a Garden: A History of Chicago’s Parks” at 8:00 PM. The City in a Garden is a compelling look at Chicago’s remarkable and sometimes overlooked park system. Through unprecedented access to a cache of historical plans, photographs, and drawings, Julia documents the city’s 175-year commitment to its public parks and explains how luminaries such as architect Daniel H. Burnham, landscape architect and conservationist Jens Jensen, architect William LeBaron Jenney, and social reformer Jane Addams shaped and influenced the city’s green spaces. This revised edition of The City in a Garden illuminates Chicago’s ongoing commitment to its expansive park district. Since 2001, Chicago’s parks have seen a renaissance. More than a billion dollars have been invested in a wide range of projects, including the restoration of dozens of historically significant buildings, landscapes, and artworks; the reconstruction of the lakefront revetment system; the creation of new gardens and natural areas; and the construction of new beach and field houses. Chicagoans now enjoy the addition of new and innovative green spaces such as Millennium Park and Palmisano Nature Park – a twenty-seven-acre park created from an old stone quarry in the South Side Bridgeport neighborhood. Featuring new research, an expanded glossary, and additional documentary photographs, this beautifully illustrated book is a must for those who prize green spaces. We thank all who were able to attend.